Chloramine is increasingly becoming more common as an alternative to chlorine for water treatment. The Pentek ChlorPlus-10 filter can be used to reduce chloramine in your water supply. The Pentek ChlorPlus-10 carbon block cartridges help reduce sediment while providing greater chloramine performance capacities than granular carbon. They also significantly reduce the carbon fines found in many granular canisters. 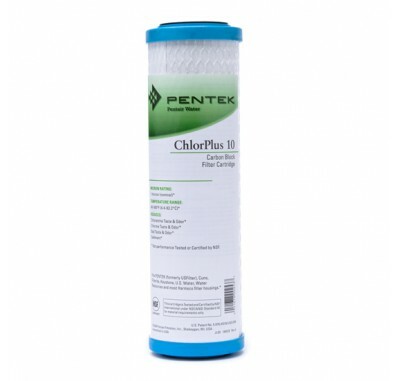 The Pentek ChlorPlus10 filter cartridge is a nominal 1 micron chloramine reduction water filter cartridge. 255416 Pentek ChlorPlus 10 filter fits in standard and Slim Line housings for 10 inch Standard water filters.